The project, undertaken by Lancashire County Council, has addressed the issue of high-energy costs by replacing the existing HID, SOX and SON Luminaires with Thorn’s highly efficient LED luminaires. This has resulted in reduced maintenance and has created a distinctive urban lighting design. Lancashire County Council issued an Invitation to Tender (ITT), which was open to potential suppliers who had the required capacity to deliver a Contract of this size. The ITT was a very detailed document that covered all the specific requirements of the client. Failure to meet any of these needs was penalised in the evaluation using a points system that calculated the eventual winner. Whilst Capital Cost is always important, the most important criteria is Whole Life Cost or Total Cost of Ownership. LCC did an evaluation of all the submissions from various manufacturers and calculated the most efficient and therefore cost effective bid over a 25-year period. Thorn Lighting Engineers were able to provide efficient solutions for the various lighting design scenarios, whilst meeting all of the stringent requirements for the project, including warranty, lead times and after sales support, becoming the sole supplier for the entire scheme. Thorn’s CiviTEQ is a cost-effective LED road lighting solution suitable for projects that require the best balance between cost of ownership and performance. 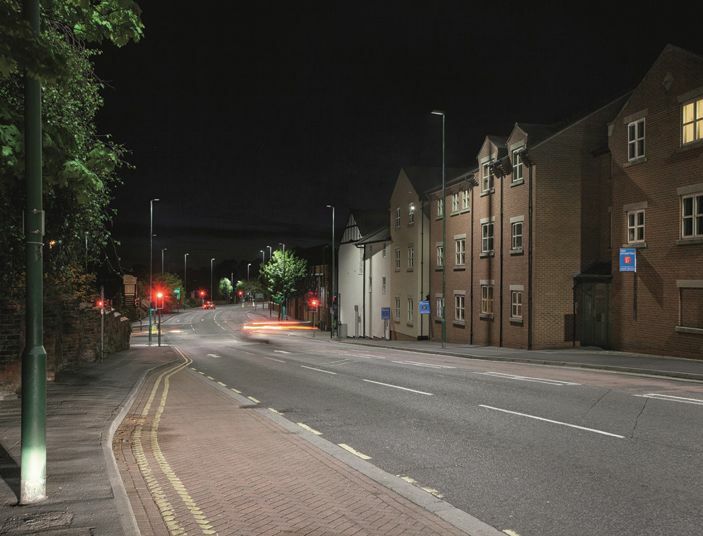 The luminaire is fitted with an R-PEC® optic to bring safe and efficient light to residential streets and high traffic roads and, with 2 size options up to 17klm and 12 precise light distributions, CiviTEQ adapts to any installation layout.